Gout Epidemiology • Affects up to 6 million individuals in US • 1%–2% prevalence in adult males • Renal insufficiency is the most common cause of gout • 9 times more common in young men (65 years of age* • Among those >75 years, the prevalence increased (1990 to 1999) from 21 to 41 per 1000 enrollees • Among those 65-74 years of age, prevalence increased from 21 to 31 per 1000 enrollees (1990 to 1999) * Gout defined by ICD-9-CM codes 274xx or use of uric acid–lowering drugs Wallace Kl, et al. J Rheumatol. 2004;31:1582–1587. MTP: metatarsophalangeal Wallace SL, et al. Arthritis Rheum. 1977;20:895–900. Netherlands Proposal: Diagnosis Without Joint Aspiration 7 variables "easily ascertainable in primary care": • Male gender • Previous patient-reported arthritis attack • Onset within 1 day • Joint redness • Involvement of the 1st MTP • Hypertension or 1 or more cardiovascular diseases • Serum uric acid level of more than 5.88 mg/dL Janssens HJ, et al. Arch Intern Med. 2010;170(13):1120-1126. • Although advanced imaging can identify soft tissue collections, there are no imaging modalities than can specifically diagnose tophi • In general, use of and coverage for advanced imaging technologies is not an issue for MCOs Wallace SL, et al. Arthritis Rheum. 1977;20:895–900. • Gout flare defined as episode with gout diagnosis followed by: • Claim for NSAIDs, colchicine, corticosteroids, ACTH, or intra-articular aspiration or injection within 7 days, OR • Diagnosis for joint pain (ICD-9-CM: 719.4) followed by claim for colchicine within 7 days Wu EQ, et al. Presentation at ACR/SHRP Scientific Meeting, October 2009. Presentation 1112. • Subgroup of 195 gout patients with ≥6 flares: adjusted incremental costs at $22 237 (P < .01) Wu EQ, et al. Presentation at ACR/SHRP Scientific Meeting, October 2009. Presentation 1112. 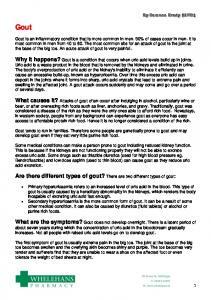 Report "OVERVIEW AND EPIDEMIOLOGY OF GOUT"